※This image was quoted from the Official Website of Ajinomoto General Foods. 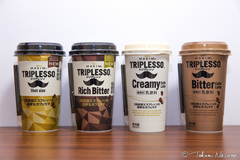 TRIPLESSO is a trademark of the coffee product made and sold by Ajinomoto General Foods, Inc. (Scheduled to change its name into Ajinomoto AGF, Inc. in July 2017). This was named after its feature - espresso triple strength. It started on sale on April 1, 2013. In the beginning, foreign companies owned the trademark of TRIPLESSO, and Ajinomoto General Foods, Inc. was using the trademark under the license with them. After its parent company, Ajinomoto, Inc., succeeded in buying the trademark on October 31, 2016, the trademark is now fully available for any brand strategies for Ajinomoto Group. 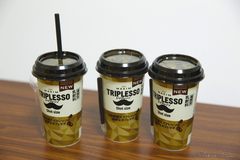 There were four categories of TRIPLESSO - chilled cup coffee, bottle coffee, instant coffee, and stick. And especially the category of chilled cup coffee, which was sold in convenience stores around Japan, was magical enough to change ordinary people who happen to take it into its mad believers by the impact of its package with black beard and thick black words, by the simple nice name and euphony, and by the amazing balance of rich coffee taste and sweet milk taste. I guess that the old and the young, and the male and the female who were charmed by TRIPLESSO must get bored of un-richness of other coffee, start to insist like "TRIPRESSO chilled cup coffee is more delicious than any other coffee brewed in cafe", spending everyday visiting convenience stores nearby and taking "the black beard trademark" as usual. After searching the word "TRIPLESSO" and found other categories, they must have bought the bottle coffee and instant coffee. They must have made a original gorgeous latte by mixing expensive milk, enjoyed an original devastatingly-rich soy latte by mixing soy milk, and enjoyed an drug-like drink by putting excessive instant coffee powder into milk. Ajinomoto General Foods, Inc. announced on its official website that they were going to stop producing the bottle coffee, instant coffee and stick categories of TRIPLESSO at the end of February 2017. 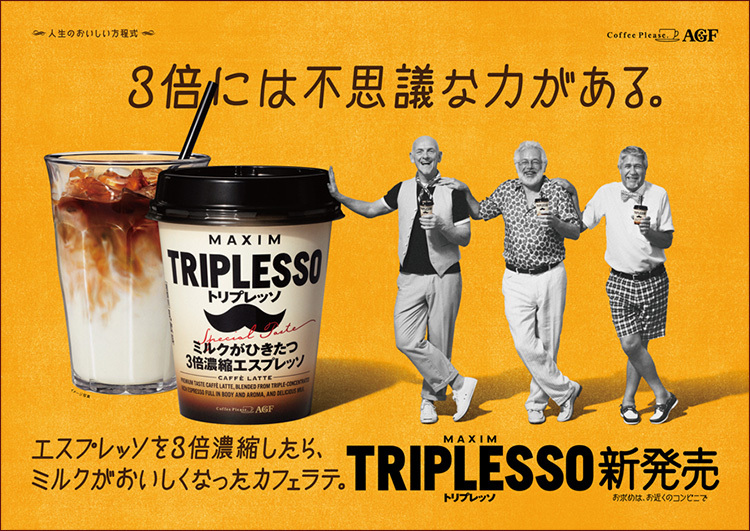 Although I wonder why there isn't any explicit mention of chilled cup coffee of TRIPLESSO, this announcement strongly suggests a critical possibility that the coffee brand named "TRIPLESSO" might be gone forever. 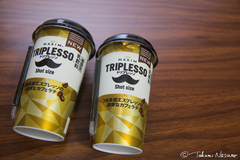 I couldn't find TRIPLESSO at any convenience stores nearby including Seven-Eleven, FamilyMart and Lawson. I don't see them for about a month. On March 28, 2017, when the company started to sell the chilled cup coffee of CAFE LATORY brand, I never see TRIPLESSO on any shelf. Once I searched "TRIPLESSO" on Twitter, I found lots of pandemoniac tweets. I have a hypothesis that compared with the other coffee brands, most of the TRIPLESSO users are those who are addicted to TRIPLESSO. As it is extremely clear once you search it, I dear not quote each of their tweets here. From their tweets, I hit upon one sad action of TRIPLESSO users under pandemonium, well, I mean "sad" as one AGF fan. Probably... the brand switch to LATTE BASE is taking place. CAFE LATORY might not be able to replace TRIPLESSO. Now, TRIPLESSO is being not available in convenience stores. This is why I looked for any stocks of TRIPLESSO at several ecommerce websites including Amazon. I placed orders, and here's what I won. 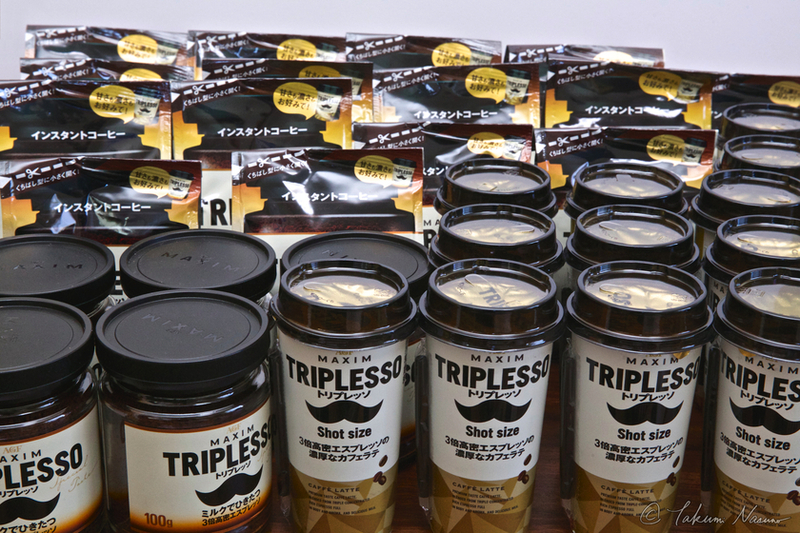 Dear Ajinomoto General Foods, Inc.
TRIPLESSO is one of the top coffee brands in the world. 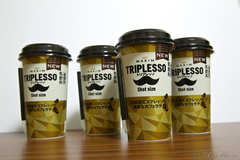 I will patiently look forward to seeing TRIPLESSO in convenience stores some day. 2017/07/10 : Good News - I found the Chilled Cup Category of TRIPLESSO not only at SANWA but also at Summit Store! 2017/10/19 : Good News - Chilled Cup of TRIPLESSO is now Available not only at SANWA & Summit Store, but also at Don Quijote! 2017/12/14 : Great News - Y'smart sells TRIPLESSO!!! 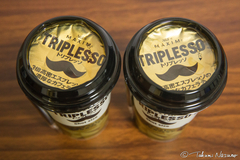 2018/3/4 : New TRIPLESSO now available in supermarkets!